What’s the one thing you can do to increase your store’s conversions? Every day you can find a new post with advice about your eCommerce store and how to improve your conversion rates. These tips and tricks are all fantastic, but they can easily pile up. How do you prioritize them? And how much should you invest – since their mileage varies? You’ve likely heard that you should offer free shipping. Amazon gets the blame for this one – even though they don’t write the posts. People simply compare every store to Amazon’s and suggest that if you have a shipping fee you’re going to lose the customer. While we’re not sure that’s exactly true, we do know it’s one of the most often delivered pieces of advice. You’ve also been told that you need excellent images. If you’ve not read the story of how AirBnB doubled their revenues in New York City, as they were getting going in 2009, it’s a fun story of how a $5,000 camera changed everything. People need to see what they’re getting when deciding on a purchase. You’ve heard that your checkout needs to be clean and clear. Peep Laja over at ConversionXL higlights a long list of conversion rate killers and several are around the checkout process. He highlights the need to think about progress indicators, multiple payment options, and keeping the checkout forms short. All of these are great ideas. But if every one of them has a cost to complete, even if it’s just the time it takes for you to make changes to your own site, how do you judge which ones you should pursue? Many people will say the same thing – test, test, test. What they’re telling you is that you need to do all of them and then see how well they paid off – which is fine if you’re technical and can do them yourself, in a single afternoon. But what if some of these require days or weeks of work? What if they require you to hire a developer? What about cart abandonment software? People have said that the right approach to shopping cart abandonment can lift conversions by up to 30%. It doesn’t matter how much revenue you’re making on your store, that’s nothing to sneeze at. But it will take picking a solution and integrating it with your store. Is that easy or time consuming? Should you use live chat software? Others highlight the power of having customers ask questions via live chat software on the store. Even if you do evaluate multiple options and pick one, and you integrate it with your site quickly, there is still the question of staffing the chat software so that customers can actually get their questions answered, right? Neil Patel wrote a blog post more than a year ago with 8 things you could do, titled How to Quickly Improve the Conversion Rate of your eCommerce Store Without Spending a Dime. While he was correct that these items didn’t have a direct fees associated with them, a friend tried to do all 8 and discovered there were actual costs for many of them. Particularly when it comes to videos (tip #3), my friend already had a phone that shot great video, but he needed better lighting for product videos and that had a cost. He also needed a white box that would create a shot of the product without distraction. And he purchased audio clips to run in the background. One this is true – the articles by Peep and Neil are excellent sources of conversion rate optimization tips. We’ve seen articles that have long lists of steps you could take (20, 30 and 40 tips) to improve conversions. But that’s not our goal. Our focus is on the most important thing, the one thing, you can do to improve your conversions. And we believe it’s the first thing you should focus on, before all the rest. The single most important thing you should focus on is speed. Before you focus on anything else, this single aspect of your site will have the most impact and effect on your conversions – and not by single digit percentages. The good news is that real user monitoring data from 33 major retailers shows that conversion rates increase 74% when page load times decrease from 8 to 2 seconds. As you work on the load times of the pages on your site, you’ll see it pay dividends. The speed of your store when it comes to loading its pages has the most impact on conversion and revenue than any of the previous items mentioned. Check out the video as I explain it further. Hosting companies with their own data centers make large investments in assets – these capital expenditures (CapEx) include buildings, servers and the emergency equipment to protect the datacenters from fires. While you see some hosts shifting to an OpEx (operational expenditures) model to increase their business agility, they face other challenges (like not having direct control over their infrastructure, struggling to explain to customers that they’re having their own vendor problems, pricing and more). But for companies that have made their own investments into data centers and hardware, they’re not likely to make a change to their technology stack quickly. After all, it would require another major investment. As you would expect, the performance of these data centers degrades over time when hosts don’t make additional investments. And that has a direct impact on the performance of your own site. We don’t talk about it a lot, but here’s the reality. The fastest way to get better performance on your site is to change hosts to one that has recently made an investment in their infrastructure. It will likely mean that you consider making a move like this every 4-5 years, unless you know for sure that your host is making regular and continual investments on their platform. 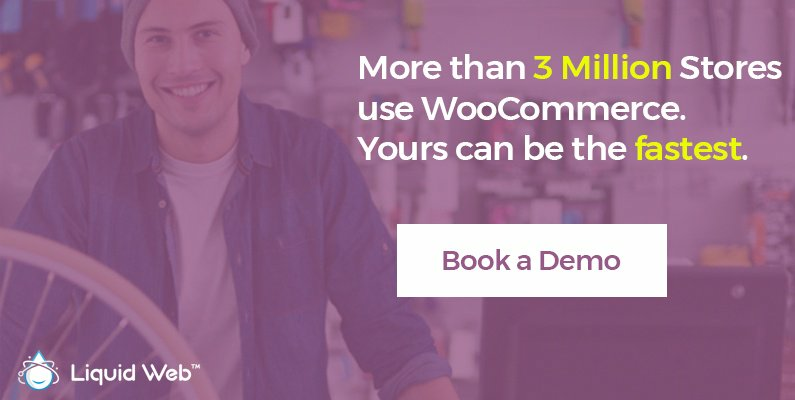 Did you know the average WooCommerce store loads slowly? It’s a sad fact that most of the WooCommerce stores we see all over the world load slowly. On average, we see stores load in 5-10 seconds. And we know how that impacts a store’s conversion rates. Notice that none of this is related specifically to WooCommerce itself. At Liquid Web, we’ve made the investment in new hardware and designed new clusters where we’ve tested WooCommerce stores (with tens of thousands of products and thousands of orders for each product) and seen consistent load times under one second. It’s a combination of several dynamics – engineering, software, partnerships and more. But the results are clear – and work in the favor of every store owner. Because faster sites have better conversion rates, by far. Check out our new Managed WooCommerce Hosting product.